Do a Google image search for protest symbols and your first page will show a range of raised fists, Guy Fawkes masks and possibly even a few giant inflatable rats. But by far the single most represented image you’ll see is the peace sign. It is probably the most famous protest symbol in the world and has its origins in the British anti-nuclear movement of the 1950s. The sign represents the semaphore signals for two letters: ‘N’ (the two diagonals pointing down) and ‘D’ (the vertical line that divides the circle), which together represent nuclear disarmament. It has become the symbol of anti-war and social justice movements across the globe. The aim of a symbol is to communicate as immediately and directly as possible the core of what you represent. It is the shorthand for your values, your aspirations and sometimes your political agenda, if you’ve managed to put one together. Which brings us to an important question: Is it time to consider a new symbol for a new era? I was at a conference recently with pro-democracy activists from the Middle East, Asia and Latin America. They expressed a strong feeling that their aspirations and values were linked despite working in dramatically different contexts and against ostensibly different adversaries. They felt united in their commitment to nonviolence, to sharing strategies, to building and putting up as much as to removing and pulling down — all in an attempt to construct a different vision of the future. They also emphasized the importance of being connected in order to find strength greater than the sum of their individual powers. Near the end of the conference, someone observed that there really is no political symbol that represents that list of values and goals. The peace sign has a lot of significance, but its origin is very specifically nuclear disarmament, and even its broader connotation is narrowly that of peace. Another symbol handed down from previous generations is that of the clenched upright fist. It immediately conveys an expression of defiance, resistance and solidarity, but is agnostic in what it might resist. Therefore it has been used by a disparate number of groups and movements including the Black Panthers, white supremacists, the Serbian revolutionaries Otpor, Egypt’s April 6th Movement and the Socialist International, to name but a few. And although some of those groups were strategic, networked and nonviolent, some were not. A more recent symbol is the ubiquitous Guy Fawkes mask often seen at Indignado and Occupy protests that alludes to a “vendetta” against the 1 percent. It doesn’t quite fit with what much of these movements seem to be about, at least not in terms of the method intimated. So I approached a long time collaborator, Carl Le Blond, who has created some of the most powerful visual content on issues from Burma to HIV/AIDS to climate change, to see if he could help. We had some lengthy discussions about what a symbol needed to do and represent, as well as the importance of investing it with meaning — which often comes from who’s using it and how. The existing symbols seemed to emphasize a particular dimension of struggle: nonviolence, defined by not using violence (though it is much more than that), or resistance, defined by what you are against and often neglecting what you are for. Few gave a sense of building something new. If many in the Arab Spring, Occupy movement and Indignados believe they are all connected, what would their symbol look like? Despite being in the middle of a number of massive deadlines, Carl eventually put pen to café serviette — an old-school medium for great ideas and images. A few days later he had worked up his initial idea and the people’s cube was born. 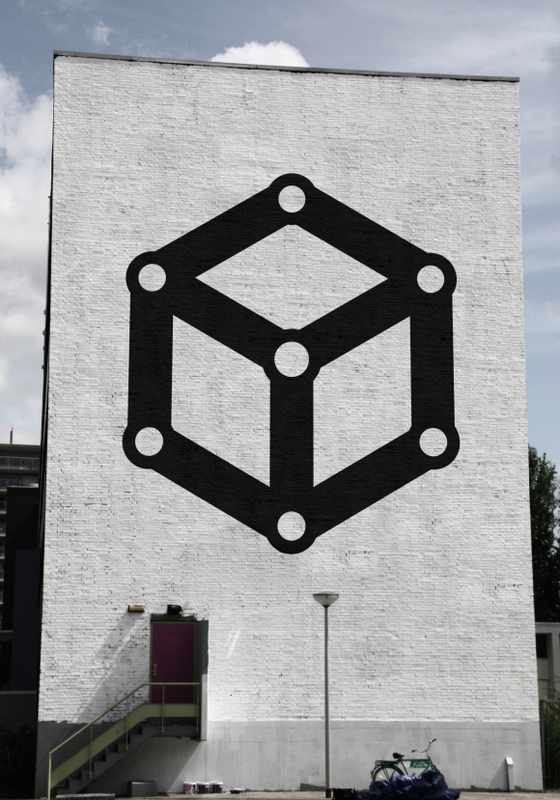 The people’s cube is on first sight solid and immovable from every way that you look at it. It has the simplicity and latent strength of a perfect molecular structure. Though in this case the molecules bonding together are symbolic of people standing together with their arms locked to form a symbol of strength and unity. It seemed to represent much of what the activists I met had been talking about: being connected, constructive, strategic and networked. I sent it around to them and was glad that it got an enthusiastic reception. It will be interesting to see if and where it might pop up first. Now it may not do it for you. And that’s cool. But it’s worth thinking about, as these are new times and they are worthy of new symbols. Grab your stencils now! John Jackson is co-author of Small Acts of Resistance, a collection of stories which show how courage, tenacity and a bit of ingenuity can change the world (www.smallactsofresistance.com). Glad you like it Alyce. And judging from comments below, cubes of various types seem to be emerging. I’m hoping this one has some design qualities which give a bit more thinking around some of the values mentioned in my piece. The symbol works best for me when it loses its cubic nature and goes flat, but then it starts to look like an angular upside down Peace symbol or a Buddhist Dharma Wheel lacking some spokes. I think you have a good point about it working as a flat graphic, and no bad thing if it takes on similarities with the Peace symbol and other positive symbols, if at the same time it encapsulates a new meaning that seems ripe for the present. That new symbol looks good, although the connotations are still to be known and felt. That said, I like the old peace symbol better with circle connecting the arms of the movement. I never saw the N and D, and I think most people see the symbol mainly as a call for peace and human values. Although I find this new “flat cube” symbol to be strong, I think the older peace symbol is stronger and easier to read. I think the Peace symbol remains a brilliant example of what a symbol should do – I’m a fan. And not doubt it will continue to represent those things we associate it with. However, I do think there is a need for something that symbolizes the other values that are important across many of the new progressive movements. This is just a suggestion of what that could be. I can imagine it customized in the same way as the Peace symbol too, which might address some of the other comments, flat, rounded, just the lines, or just the circles/dots – multi-coloured. There are ways to make it quick and easy to replicate too. I like the idea, I am not fond of this design, it is too square and calculated, I am a graphic designer and seeing an “n” and “d” is not very easy. I see a cube with holes in it and to me, it lacks soul and humanity. The peace symbol of the 60’s was a circle and fork was on the bottom like the roots of a tree, strong and firm. The circle took away the edges and contained the tree as in a mother’s womb. I think the new design is meant to indicate building something together. The N and D are in the peace sign, not the new sign proposed. And they are not Latin letters N and D; they are a semaphore (where people signal with flags like in the navy) representation. They were designed in the late fifties for the anti-nuclear movement in the UK. The symbol literally stood for “nuclear disarmament.” It will always symbolize the sixties and the hippie culture, and nuclear arms fears and I don’t see the tree imagery you instill in it. I like this new symbol, but I think someone using it should have a solid ideology before they just paint it on something. @Alyce, it’s so interesting. I’ve been seeing the cube image on hand-made signs at Occupy things. This is so weird. I’m still not sure I love the symbol, but it does seem to be catching on throughout these movements, independently. @Kaleo, I resonate with what you say about it feeling “square and calculated.” It feels too designed. These movements are made out of hand-made signs, not out of computer graphics. I wonder if something can be done to make this symbol more dynamic and organic. I think perhaps some form of a spiral should be adopted, representing an evolutionary paradigm. All things evolve and develop and expand… matter, systems, people, psyche, ideas, values, etc. I think this puts forward a positive image of what human life and society, done right, can be. I think a lot of these old paradigms and symbols representing breaking down and not doing bad things (like the fist, etc. ), which can alienate people. I long for universal symbols that can.. well.. unite, in a intelligent way that doesn’t gloss over the differences and necessary struggle. Sketching it out, I like it a bit better when I elongate it for more of an “uprising” feel… that said, I think the cube carries a lot of connotations of conformity these days. But you can’t stencil it. You would need a ton of bridges for the circles. It also can’t be easily drawn. Think of the two symbols that already exist that accomplish these goals: the peace sign and the circle-a. To draw a peace symbol: draw a circle, draw a line bisecting the circle. then draw a line on either side of the bisector to form pie-slices. Four strokes. To draw a circle-a: draw a circle, neatly write a capital letter “A” in the circle. Four strokes. Both symbols also translate to stencils very easily.because you can bridge them easily or you can have two layers. How many strokes is the 3D cube thing? 9 strokes, and then you also need to add those little circles. Then you need to also cram in 7 little circles. For it to be a catchy symbol, it needs to be like a visual meme. When you see it, you can draw it. Try this as an experiment, open paint on your computer and draw a peace symbol. Now draw a circle-a. Now try to draw this image from memory. Don’t look at the artwork above. If you can manage it, I’ll be impressed. It’s a nice looking symbol, but it lacks the repeatability of other image. Great point… I wonder if the inner circles are really necessary. Without them, it’d be easier to stencil. Cute, but logo’s or symbols derive their meaning from how they are used rather than how creative and philosophical the designers got in dreaming it up. And I’m not clear why we need a new symbol for a new era when we haven’t achieved the goals of the first last one yet? If you want to get all mystical then you could say the cube emphasizes four lines instead of three. (The shift from 3 to 4 featured in the writings and dreams of Carl Jung as symbolic of a new (aquarian?) age.) But the circle is the most mystical and primitive symbol of all: unity, the earth, the moon, the sun, the smallest point you can make with a pen (a dot is a circle), but never ends when you follow the edge. that said: 2D/3D puzzles, and images that differ when you focus on the black versus white, are generally avoided in the logo/branding world. The ideas, on the other hand, are marvellous! Global unity, an international standard minimum wage that all can live on, a planet that is protected for future generations… bring it on! I vote for a simple circle. Plain, but perfect. Minimalist, but eternal. Choose your own color, for infinite variations. I think there’s unique power to the circle as well. Though, in traditional symbolism, there’s something distant and otherworldly about circles; they’re a perfect, eternal, abstract form, never quite reachable from earth. 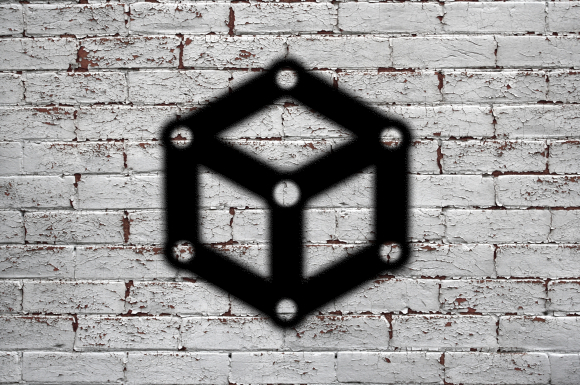 Squares and cubes (ironically, since the earth is itself close to a sphere) represent earth, and the material: four cardinal directions, four basic “elements.” In this respect, I think the cube is appropriate to the issues we’re concerned with, actually. While the peace sign’s circle represents an abstract, almost utopian hope for peace to reign, the cube stands for a struggle for something more material: a just distribution of resources, international solidarity, interconnectedness in actions and ideas, and more. I do like the fact that this symbol includes circles in it as its basic units (representing the sacredness of individuals and groups, I presume), though Robyn makes the point above that they will make it harder to stencil and spread. some great food for thought here. the thing i like most about the proposed symbol is that it can be seen in different ways, as flat or 3D. 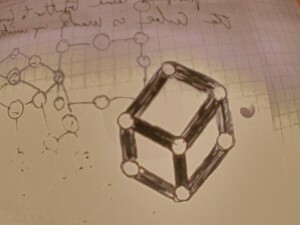 i think the ability to see things from various angles simultaneously is integral to the emergence of new systems and ideas (this was what i was thinking when i made the box-within-a-box graphic linked in the first comment above). I agree with Michael Paone, a spiral symbol would be the best suggesting more freedom of movements through space and time. Cube and circle represent the opposite = Prison and Limitation. People should study these things before taking wrong decisions, any symbol contents powerful subliminal suggestion affecting people’s minds. Be aware of cubes and circles, they do not represent freedom, and freedom is the most important thing ever.